This sweet stamp is In The Doghouse and I think it's so adorable! I colored the image with copics and then used a white gel pen to add highlights to the flowers. I also added Nuvo Crystal Glaze to the dog's nose to make it shiny. I used the Gingham Background stamp to create the pattern on the front of my card and the sentiment is from the Polka Dot Fun stamp set. How sweet is this?! LOVE that Gingham background and your color palette is always so pleasing. 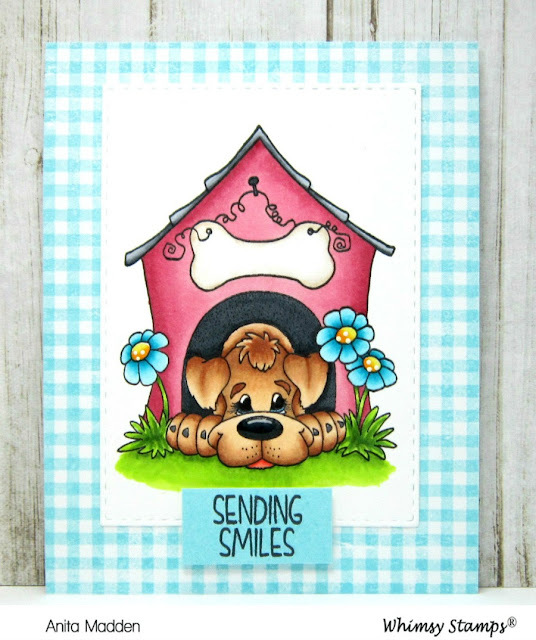 Thanks for being a great special guest for Whimsy Stamps!